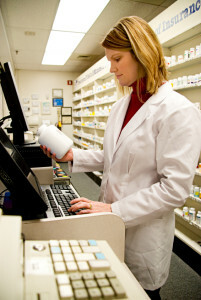 Pharmacies can use Pharmacy intercom systems in a number of innovative ways; for controlling entry, communicating with customers more effectively, in clean room and air lock communications and for department announcements. Intercom technologies allow you to operative safely and efficiently within your pharmacy, protecting your staff, visitors, and potentially dangerous pharmaceuticals, without having to invest in costly security personnel. For pharmacies and pharmacy departments security is key. It is imperative you can control the people that gain entry to the department to protect both the individual and your assets. With a Door Entry Station, a receptionist or authorised member of staff can easily control access to restricted areas with just the push of a button. At the service desk, Help Points allow patients to benefit from a high level of customer service, even if the desk is not permanently manned. Help Point Intercom Systems provide visitors and patients with direct access to staff. This is particularly useful for customer service desks manned by a single employee who can’t be at the counter at all times. For use in sterile environments Ring UK provides Clean Room Stations, which are specially designed to offer hands-free, germ-free communications. These flush fitting intercom solutions provide Duplex communications to the rest of the pharmacy – and they can be wiped clean to maintain the highest level of hygiene. Clean Room Stations can also be used to communicate in air locks – allowing voices to be heard from one side of the lock to the other. Ring UK can also advise you on Public Address systems for use in a pharmacy setting. These systems can be used in a number of ways – to announce an emergency or critical situation, to relay urgent information and even when looking for a patient or member of staff. For advice on our range of quality intercom systems, speak to the experts at Ring UK.